Suez & Panama Canals, Philadelphia Region, and demand for Commercial Real Estate? Is there a relationship between Suez & Panama Canals, Philadelphia Region, and demand for Commercial Real Estate? Melissa Grimm of Grimm and Grove Communications was the Moderator. Panelists included: John Vickerman of Vickerman & Associates, LLC, who shared his opinions on the Suez and Panama canals including the global shipping industry; other shipping experts on the panel were Thomas J. Holt, Jr. from Holt Logistics Corporation, and Susan Howland from the Howland Group. The other panelist CEO Bill Hankowsky from Liberty Property Trust was very knowledgeable regarding ports and ports connections to Commercial Real Estate. What I heard is that the huge container ships carrying 12,000 to 18,000 TEU have changed the shipping industry. A TEU is a Twenty foot Equivalent Unit used to describe a ship’s cargo. The Philadelphia Ports were important in the past due to the Navy Yard and large oil refineries. Saving the refineries was a huge benefit for our region and the Philadelphia Port. Philadelphia is/was the 2nd largest refinery port outside of Port Arthur, Texas. South Port in Philly could be a major distribution port for Energy. Owner’s of goods being shipped look for the following: Reliability, Competitive Rates and Time to Market. Part of the time to market is the “dwell time” of a ship in port to unload – average “Dwell Time at our port is 6 to 8 days”. The success of the Philadelphia ports creates jobs and demand for distribution warehouse. Over whelming monstrous ports and predictions of even more gigantic container ships. In the past, Philadelphia’s Ports were critical because of the oil refining business (Philadelphia Port was 2nd largest Oil refining Port in USA) and the former Naval Base. Our regions large population is an advantage, and also a disadvantage, for the Port. A Disadvantage of our large population results in congested roads. The congestion on some roads causes some Big Box warehouse Users with Central, PA and the Lehigh Valley locations to use other ports such as the Port of Baltimore. This port substitution happens because it is easier to truck products up from Maryland to Central PA then to truck them from the Philadelphia Port due to road congestion. It is all about getting goods, natural resources, and commodities to markets with: 1. Reliability; 2. Competitive Rates; and 3. Time to Market. When making the decisions of who ships the goods, owners look for those three benefits. “…there are about 90 deep water ports in North America.” 386 ports are in North America. The #1 port in the world is Shanghi and #2 is Singapore. Quality of Life is directly related to Global Trade. 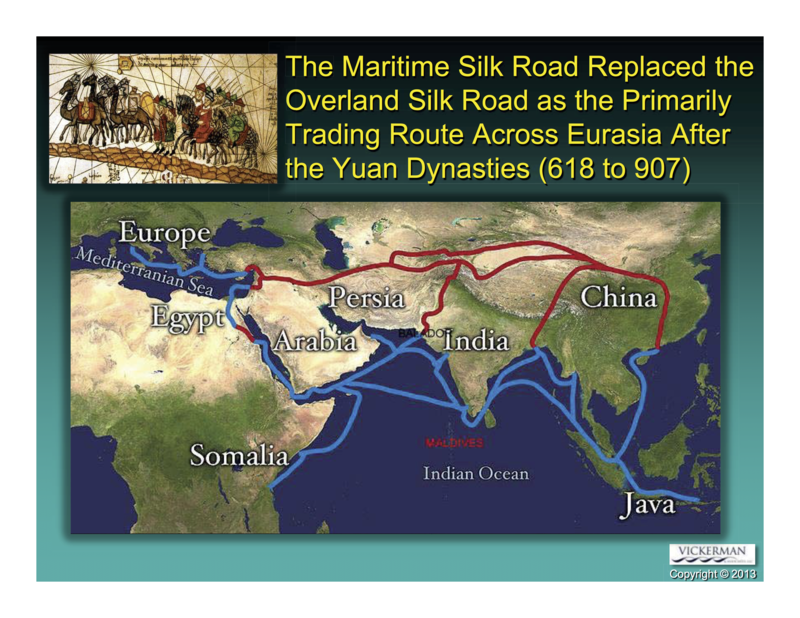 The old Maritime Silk Road has not changed, even today. 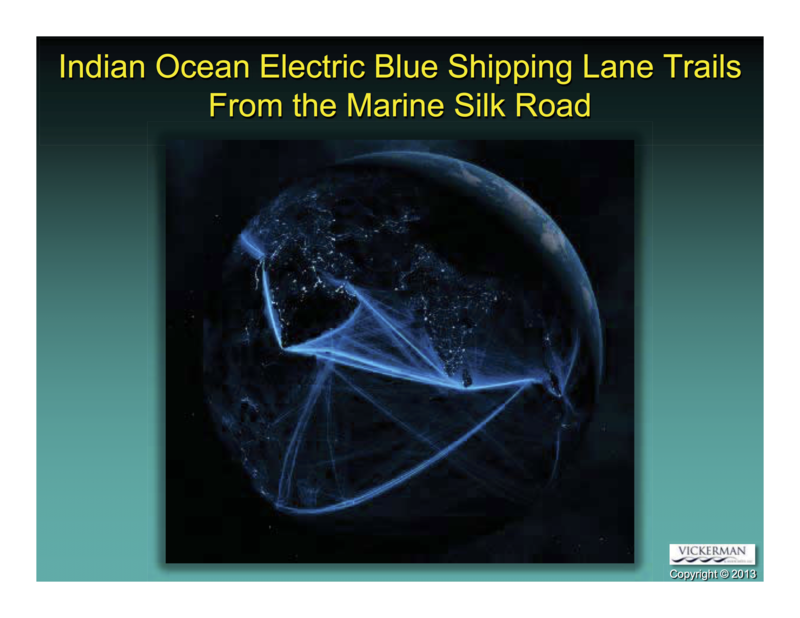 A great image was shared from the Maritime Silk Road at night and you could see streaks, paths of lights indicating the shipping lanes. One of the canals can charge $432,000 per ship. Was a reference to “Users” think the Panam Canal cost will increase by 600% by year 2025. Walmart generates about 15 % of the world’s shipments of goods. Ship sizes have increased about 24% between 2008 and 2014. South Korea, China build most of the worlds commercial ships. Panama Canal building a third lane. The capacity of expanded canal is limited due to the amount of water required to get the bigger, deeper ships to come through Canal’s new lane. Today the capacity is for ships with 4,800 TEU’s tomorrow 12,600 TEU’s. But, future capacity of ships is 18,000 TEU capacity per ship. 18.5 % growth rate for the Panama Canal. Government of Panama built two big ports at either end of the Panama Canal. This part of the discussion leads into idea of trans-shipping The trans-shipping might be beneficial for the Philadelphia Port. Philadelphia Ports – saving the refineries was huge. When you think about warehouse then think Distribution Centers. Distribution Warehouse is serving a region. Examples Allentown and Bethlehem, PA area rank about 8th in the top Ten US Industrial markets. Big Box in NJ at Exit 6A, North Jersey built out and warehouse moved West of NJ. He does think we need to think a little bit about Disruption. Disruption could be caused by three D Printing, inland ports, smaller trans-shipping, completion of the Panama Canal. There are a few major shipping companies that control the Global shipping industry. Philadelphia’s South Port could be a major distribution port for Energy. Answer is Yes. The Suez and Panama Canals, our City’s Ports, and the Demand for Commercial Real Estate especially warehouse/distribution property are related.